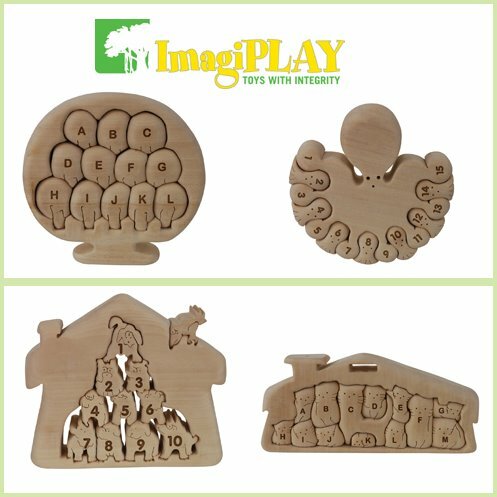 My favorite puzzle company, ImagiPLAY has introduced some new puzzles that will be sure to challenge your little one. The unconventional way they mix shapes with numbers and letters makes their puzzles different from anything else on the market. Their new styles will keep your child’s imagination active while also keeping the earth in mind. These all natural 3D puzzles offer learning, beauty and creativity! They not only help children learn their ABC’s and numbers, but they also nice enough to be hung on a wall afterwards. Watercolor paint kits are included. For 2009 ImagiPLAY expands their popular Colorific Earth puzzles. 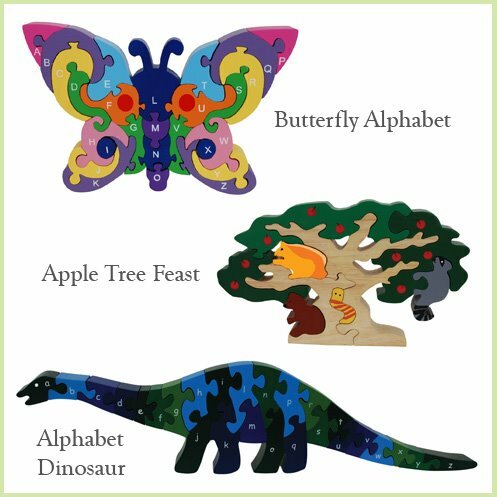 The Butterfly Alphabet, Apple Tree Feast and Dinosaur Alphabet are all Hand-crafted & hand painted with child-safe paints. Parents will also appreciate that they are made from plantation-grown rubberwood, an environmentally- friendly hardwood.